I’ve been away this week to Cumbria. In my profession, every so often, it’s necessary to retreat to somewhere quiet where I can work undisturbed for a few days. 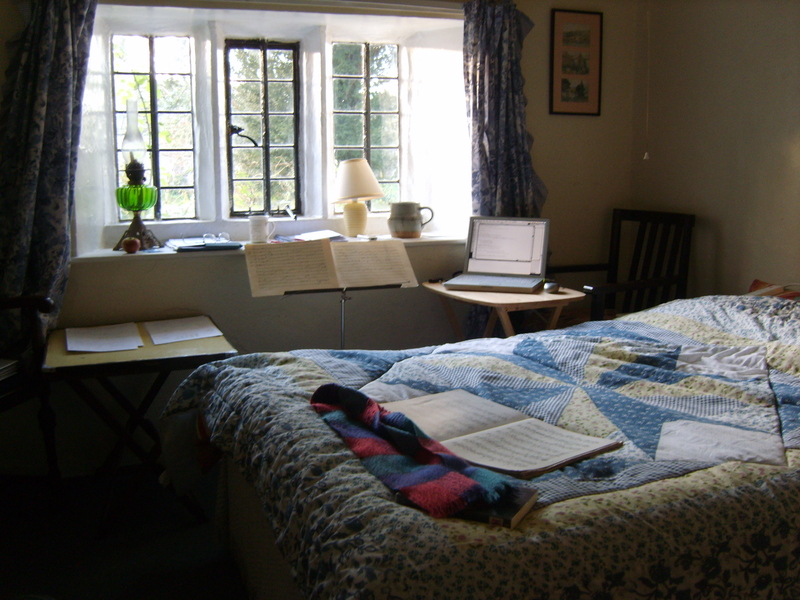 Usually, it’s to get a new composition started: quality thinking time. Sometimes, it’s to make some progress when progress hasn’t been good. This week it’s an experimental few days to see if a new location can work some magic on preparations for a concert and progress on a piece that’s getting a little behind schedule. This quiet place, I found last summer, is just one of those special locations that seems to weave its magic from the first visit, and one ends up longing to return to see what else it might reveal. At the moment I’m experiencing it for the first time in late autumn. To get an idea of what this is all about take a look at this little ‘work in progress’ presentation on my website. I first came to this part of Cumbria earlier this year to learn to weave. Once a week my former teacher weaves with a small group of fellow weavers at Farfield Mill in Sedbergh. This 19C woollen mill has become a centre of excellence for textiles and has its own studio community of weavers, embroiderers and many other crafts. 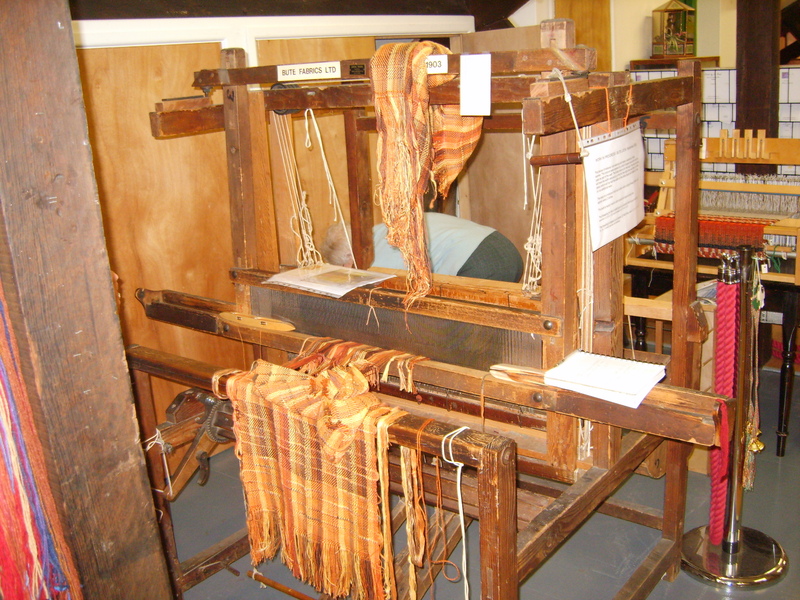 A working mill until the 1960s it was saved by the town’s residents and still manages to operate its Dobcross looms for special woven projects. On its fourth floor there’s a varied collection of hand looms, and this is where the Friday Weavers meet to spend a day working on projects that they leave in situ for the many visitors to see. As I hope to join this group on a regular basis from the New Year I was kindly invited to join them for lunch. The result was I got to spend the most valuable afternoon studying the varied projects the members of the group were working on. I can’t really begin to do justice here to all the notes I made, the questions I asked (which were most generously answered), the ideas that were generated, and the inspiration I received. Margaret was working on a table mat, ‘something simple’ she reckoned! It looked far from that (see the pattern, a ‘goose eye’ by Margaret Davison, in the gallery below). 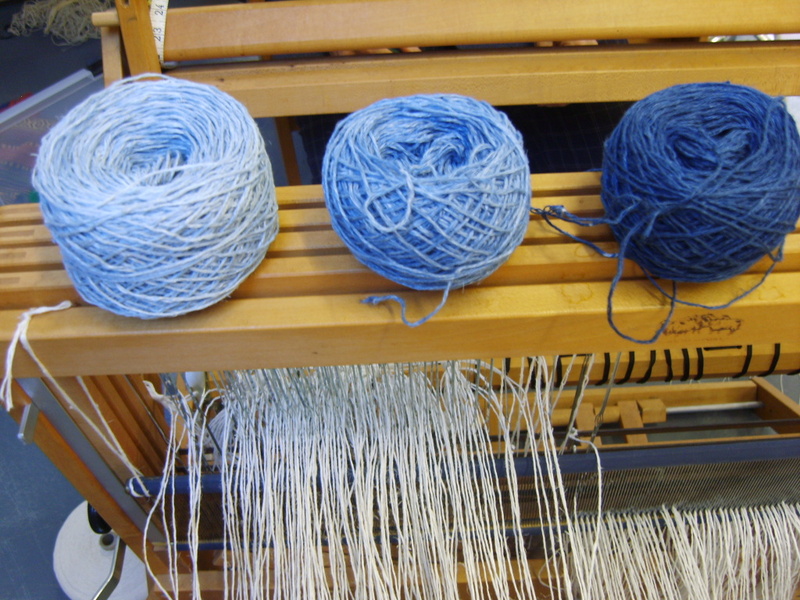 Her warp was in white linen and the weft was going to be in three shades of blue linen, self-dyed (3 stages of indigo). When I arrived she was half-way through threading heddles and I noticed that she had hung the reed from the castle, having initially used the reed as a raddle. She then brought the reed around the back of the loom ready to thread. Once threaded the reed would be removed and replaced ready to sley from the front. I mentioned to her that on my Toika loom the raddle has special hooks to allow it to be hung from the castle in a similar way. I noticed Margaret’s slip knots (again, see the gallery) were beautifully executed, and I resolved to master this elusive knot, not quite in my repertoire yet – it’s doing it one-handed that defeats me! Susan’s Christmas decoration was in its final stages when I got to talk to her. She was using a little folding 4-shaft loom (like the one I did my first weaving on) and executing a pattern that is the sort of thing that could have been done on a inkle loom. It’s a warp-faced narrow piece she was going to split into a number of similar hanging decorations. The thick green wool she’d dyed herself, adding a red cotton and a glittery gold fancy thread. The weft is a very thin read cotton. Look at the finished piece in the gallery below. Later in the afternoon Susan moved over to a Dryad Carpet Loom that the weaving group had brought into service for the first time. This is a copy of the loom William Morris designed and presented to the V & A. I’d come across a V & A publication from the 1920s on weaving carpets. It had a really excellent summary of the techniques, and at the back of the book the very plans for making such a loom yourself. It’s something I really want to have a go at (not making the loom I must add, just weaving on it). On a big floor loom Laura was working on a commission for a large rug. 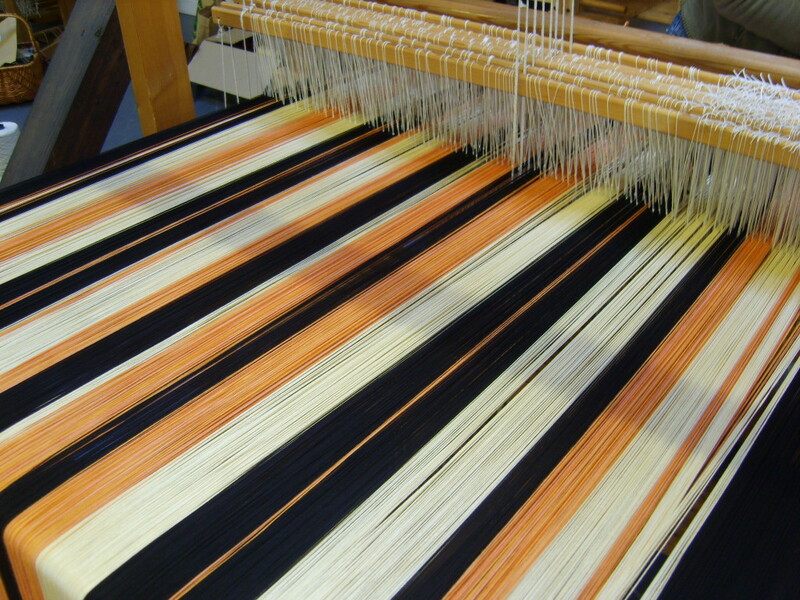 Before I arrived she’d re-sleyed the warp to make it denser and was now getting down to some serious weaving.The warp is cotton – orange and yellow @ 40 epi, black at 60 @ epi. The weft in plain-weave is @ 12 ppi and for this she was using 3 Roughfell 2-ply yarns simultaneously bound alongside a single-ply Bluefaced Leceister thread. Laura described to me how she prepared the warp: she works out how many ends she needs of each colour and makes a separate warp length of each; she then works out the threading pattern through the reed (which she uses as her raddle), threading one colour at a time. 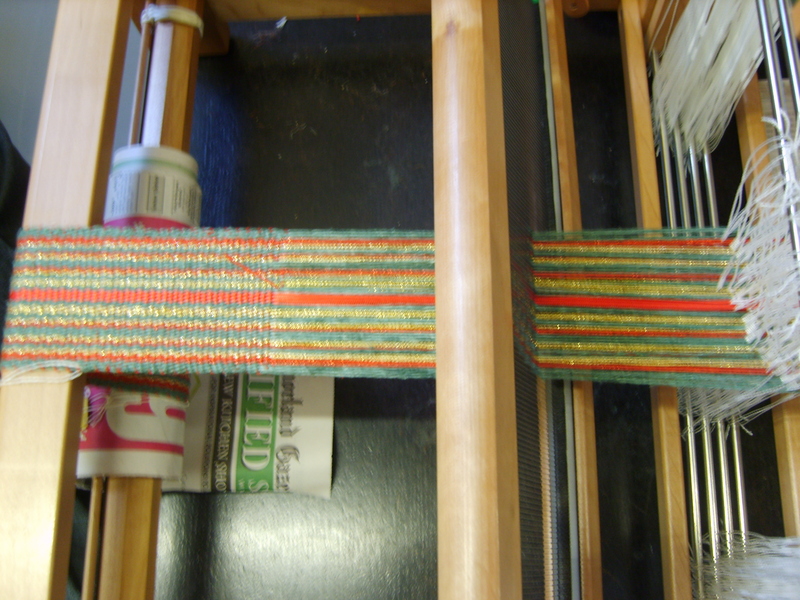 Rosie was in the closing stages of weaving a place mat on a 4-shaft table loom. 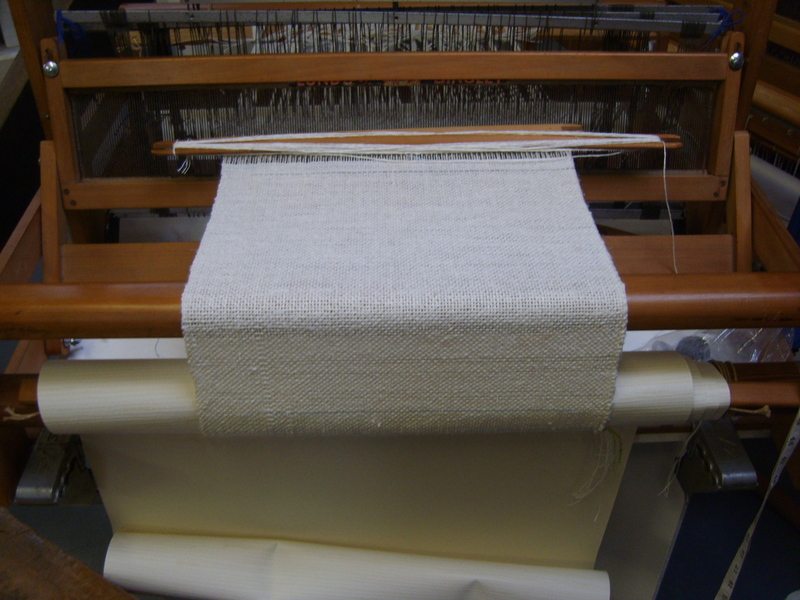 The warp was in white linen, the weft the same but with the occasional blue (hand-dyed) linen stripe (see below in the gallery). The mat is a balanced weave of twill (almost a herringbone) ends and a plain-weave middle. It was beautifully simple and the touches of colour ‘really’ effective. This for me is a perfect example of woven design and execution where less is definitely more! Finally there was Anna’s ‘3 piece’ – a project to make a jacket, waistcoat and scarf from the same pattern. Anna is working with the oldest loom in the collection, a Bute from 1912. It’s a four shaft, 4 treadle floor loom. She’d prepared, like most of her colleagues, a computer draft of her design. This shows brilliantly exactly what was going on. For me, being able to study this plan against the loom and garment itself was so valuable. I have to admit to having great difficulty imagining the process of threading a warp-based sequence of patterns via the heddles. I was reassured by an experienced weaver later in the week that it takes a long time to be able to do this, but working with computer software really helps to develop such visualization skills.. I can say now with confidence that I truly understand her computer draft – having spent some time puzzling over it and coming back the following day to check it out. 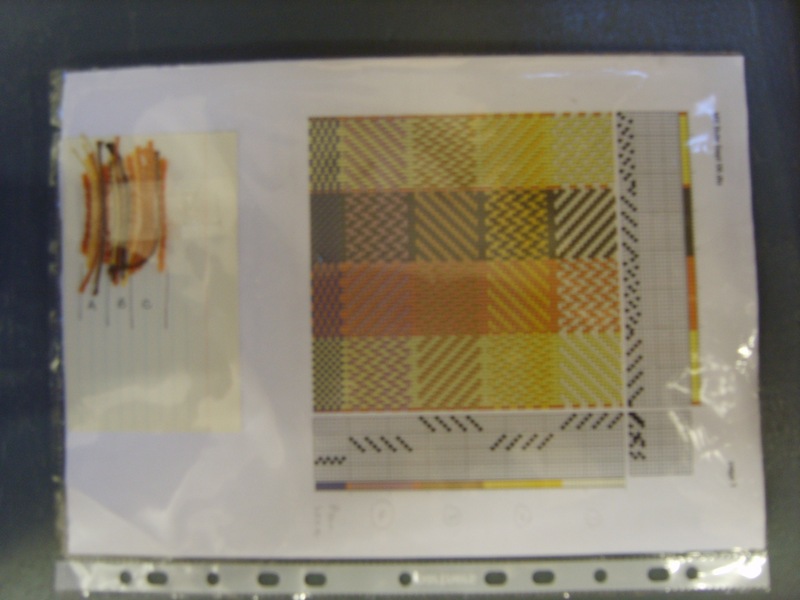 Anna had taken her inspiration from a slub containing three colours, orange, gold and brown. She created a warp in a series of segments mixing cotton and silk of these three colours together – a thick and a thin (a repp?) wound onto the warping table simultaneously. Her tie-up and treadling pattern is based on a simple 2:2 twill (12,23,34,41 and 13,23,24,14, both or which can be reversed). This whole project was great for me to study at the stage she had reached – nearly complete. Finally, it’s time to present a gallery of images that extend the pictures I’ve already shown above – with warm thanks to the generosity of the Weaving Group at Farfield Mill. Just a few words about me . . .